I was very hopeful after Clash of Kings Australia 2018 that I would be able to play on a regular basis with an updated army list. Despite the fact that I have plenty of the opportunities thanks to a very vibrant group of players here in Canberra, I was not able to find just enough time for a game. I must admit it was quite disappointing and I do need to try harder to better organize other activities for sure! Fortunately, Ed and I planned another game some time ago so I managed to allocate enough time and lock it especially for that purpose. 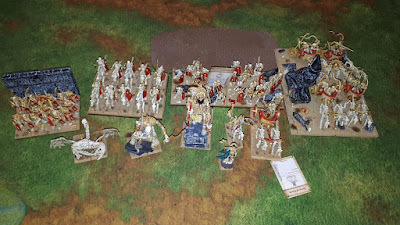 We both made changes after the release of CoK 2018 but while I made only few (as I explained in the summary of Clash of Kings Australia 2018), Ed decided it is time to bring another of his armies - Empire of Dust. It seems he decided on using it for his games in 2018 and I was very interested in seeing what is his approach with this faction like. My first impression when I read the details of this army list was that there are a lot of Shambling units and quite a lot of Surge. Out of 8 elements that are not heroes, all of them Shamble. That creates a very interesting dynamics of movement for this force. It was a perfect opportunity for me to try and learn as much as possible about how to counter that type of a threat. My first idea was to be very cautious and patient in how I use my fast units, in particular Drakon Riders, Lord and heavy cavalry. At the same time I cannot simply be passive and I do need to get those flank charges anyway. 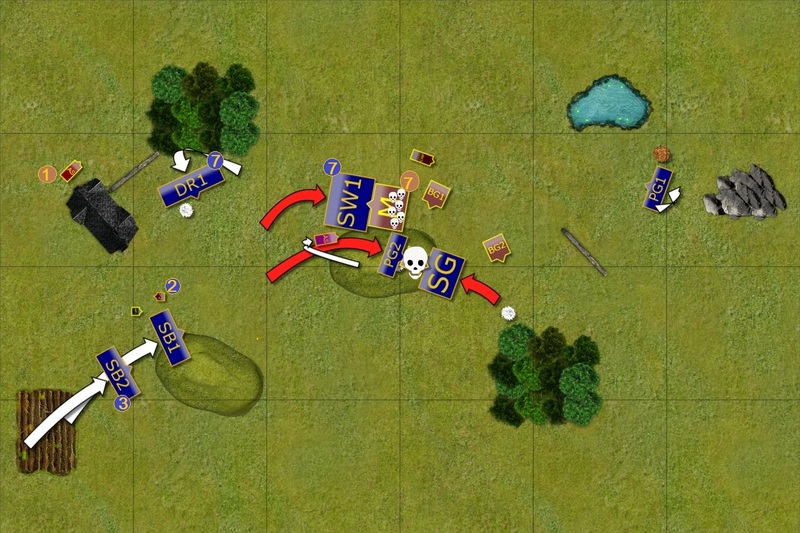 I thought that the good approach would be to combine the fact I can still position units in relatively safe distance and that I can also attack the spell casters to prevent them from Surging the units. It is, of course, easier said than done but I know that it is also important to remember that. I don't need to rout these heroes (although if I do it is always a good thing) but even that single point of damage would limit the options for my opponent. Another quite important aspect I noticed is that quite a few units sport defense 5+. While it does not make them immune to my shooting, it is far more difficult to do a substantial damage. Especially, when there is also Regeneration, Heal and Lifeleech in play. Because of that, I wanted to target defense 4+ units if possible. That has two advantages. First, I can simply inflict more damage that can be healed. Second, if the damage is big enough I can create some gaps in the enemy formation that I can potentially exploit with timely flank charges. That was the general plan that needed to be refined after choosing the scenario of course! We got Occupy as a scenario. White objectives are worth 1 point and orange 2 points, respectively. However, for orange, i.e. primary objectives, only those in the enemy half of the deployment would be worth any points. It is still good idea to control the one in my own half, simply to deny these points to my opponent. I deployed my forces to be able to contest the secondary objectives in the center and have a delaying force on my left flank to prevent Ed from reaching his primary one. 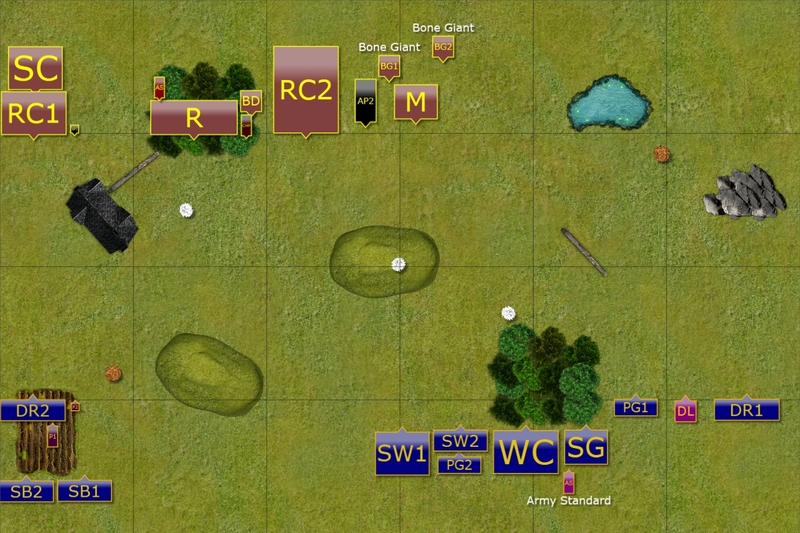 When I noticed he left my right flank unchallenged, I decided to use it to get the advantage of the speed of my units and n performing outflanking maneuver, also send Palace Guard troop to capture the objective. My plan was to use Silver Breeze on the left to inflict some damage on the chariots and cavalry and use Drakons to threaten to charge them if they moved too far. I also added both princes for help, one mainly for inspiring presence and the other to be able to intercept the units as well. Heavy cavalry would approach the enemy in the center because I needed a threatening presence there to challenge the foe and contest the objectives. War Chariots and Sea Guard would try to inflict some damage from afar. At the same time, Drakon Lord and Drakons would outflank the enemy and create a dilemma as to which units to present the front edge, the Drakons or the Knights. Ed won the roll off and his was the first turn. Empire of Dust shambles forward. The obedient minions of the Ahmunite Pharaohs started shambling forward. Majority of the army readjusted the positions. However, Renenant Chariots aimed at an Elven prince and managed to wound careless Elf. Also, one of the Pharaohs flew far forward, challenging any foe to a duel. 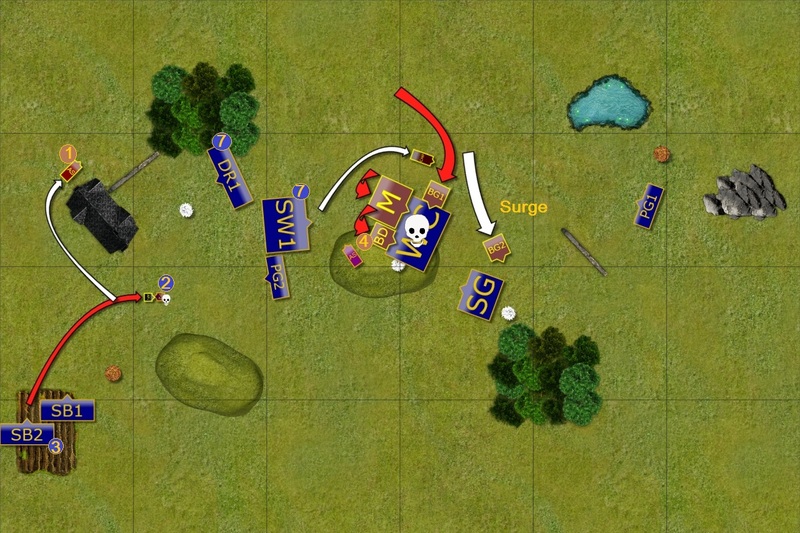 Elves in a typical outflanking maneuver. The Drakons on the left flank pulled back a bit and made room for Silver Breeze. Light cavalry aimed at the Chariots but this time managed to inflict only a little damage. As to Pharaoh, his challenge was answered by a mounted prince. 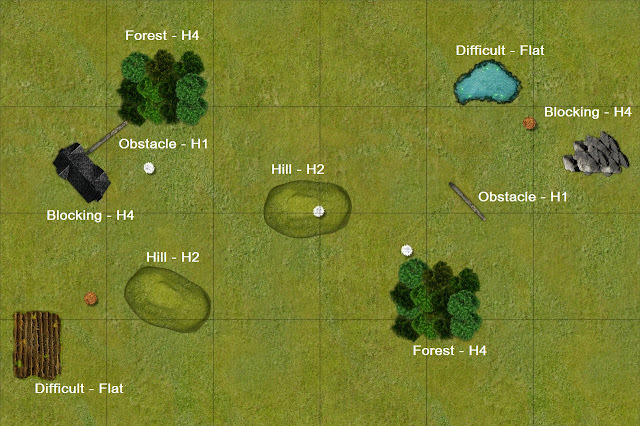 At the same time the units in the center and right flank begun the typical Elven outflanking maneuver. 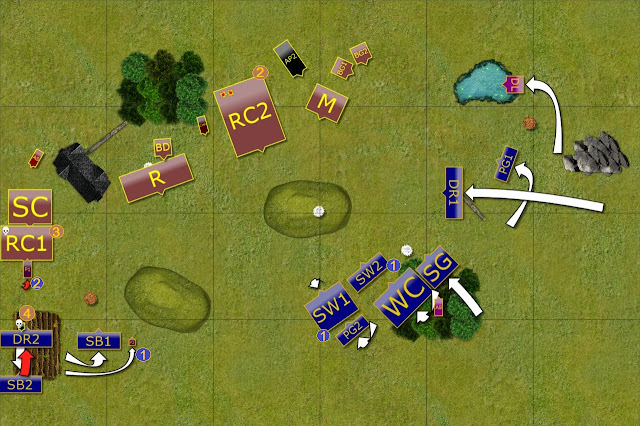 Fighting begins on the left flank! Flying Pharaoh ignore the Elven Prince and charged Silver Breeze cavalry nearby. However, he completely missed with his attacks! Then the Revenant Chariots attacked exposed Prince but they too under performed and the Prince lived! More shuffling on the left flank. 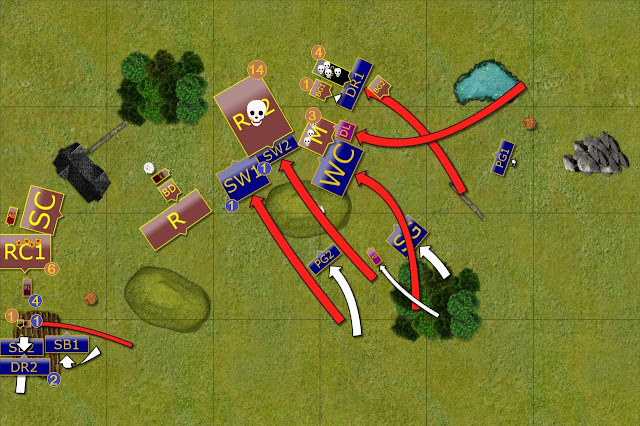 Elves exchanged the attacks on the left flank to tie the enemy units for as long as it is possible. Mounted Prince counter charged the Chariots while Drakons pinned down the Pharaoh, buying time for Silver Breeze cavalry to withdraw. On the other side of the battle careful maneuvering continued as Elves did not want to get into charge range of the enemy. Empire of Dust forces press harder on the flank. 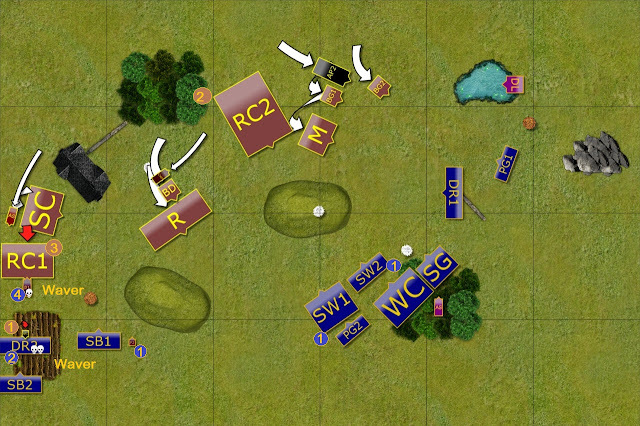 The fight on the left flank continued and the forces of Empire of Dust were prompted by their masters to press harder. As a result, both Drakon Riders and the valiant Prince wavered! Sensing that it may be the right time to advance, the Pharaoh gave his Giants a silent order to match towards the enemy. Massive charge by the Elven forces. Suddenly, the main action was not on the left flank anymore. Although the exchange of the attacks and the defense by Elven forces there continued. The bulk of the Elven army engaged the enemy. Drakon Riders attacked the Pharaoh to distract him and prevent him from casting deadly spells. War Chariots, assisted by the Drakon Lord attacked Mummies, also to divert their attention from the main line of attack. That honor belonged to the Elven knights. Storm Wind cavalry charged as one and hit against the largest enemy unit - the horde of Revenant Chariots. The charge was truly powerful and the enemy unit crumbled to dust. Although Elves seemed to create a big gap in the enemy lines, the forces of Empire of Dust were in perfect position to counter attack. 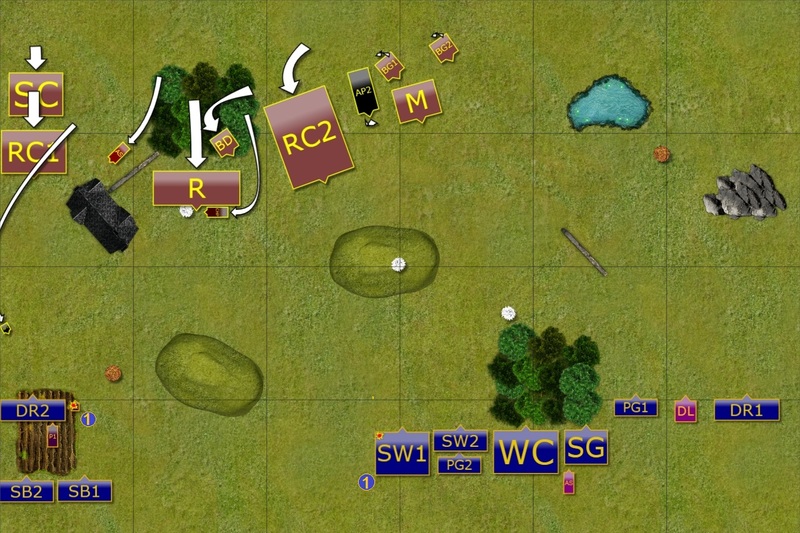 On the left flank, the Pharaoh attacked Silver Breeze again, as Elves kept alternating units and did not allow him to focus on a single enemy. In the center, Bone Dragon got surged into Storm Wind cavalry from the most dangerous direction and the smaller unit of the Elven Knights perished. Nearby Mummies counter charged the War Chariots but did not do enough damage. The Pharaoh on the Chariot and one of the Giants attacked the Drakon Riders but somehow only wavered them! The battle entered the decisive stage where both armies were locked in mortal combat and the force who gained advantage here would most likely prevail in the battle. First, Drakon Riders on the left flank attacked enemy chariots and routed them. 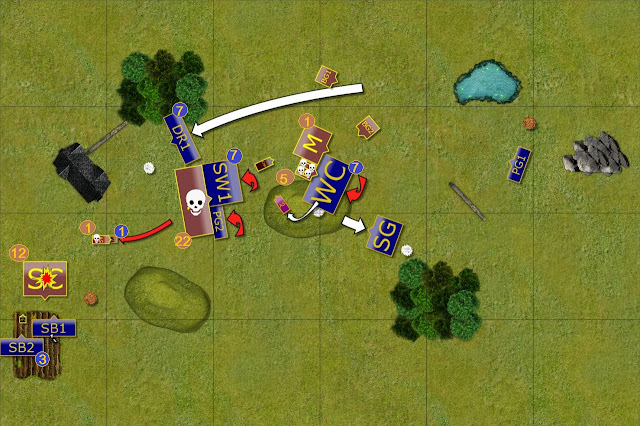 Then, Storm Wind cavalry, Palace Guard and the Flying Prince all combined their efforts to attack the Revenants horde. The damage was substantial but not enough to destroy the unit. War Chariots kept fighting the Mummies but the more important duel took place nearby. Drakon Lord took a risk and charged the Ahmunite Pharaoh from the flank. Empowered by the magic, Elven Lord inflicted substantial damage and managed to rout his opponent! Although one of the Pharaoh was gone, the forces of Empire of Dust still had powerful magic users on the battle field. It was now up to Curse Priest to animate the giant constructs and one of them caught Elven Lord before he could fly away. Bone Dragon was sent to help Mummies but somehow, even with such a potent monster, War Chariots held their ground! Revenants too did not succeed in routing Storm Wind cavalry and in the end only Skeleton Cavalry managed to destroy their foe. Silver Breeze cavalry for the win! Drakon Riders used the opportunity to fly away from the danger zone while Storm Wind cavalry together with the Place Guard troops attacked the Revenants again - this time routing them. However, the most spectacular success was achieved by Silver Breeze cavalry that did unprecedented amount of damage on the approaching Skeleton Cavalry and utterly destroyed the unit! Chariots go down - finally! With the flanks lost, remaining Empire of Dust units pushed through the center. With the attacks from three enemy units at the same time, badly damaged Chariots stood no chance and finally perished. Unfortunately for the Cursed Priest his powers seemed to abandon him as he could not properly support the advance of the Giant who failed to reach Elven Sea Guard. Elves attack in the center. 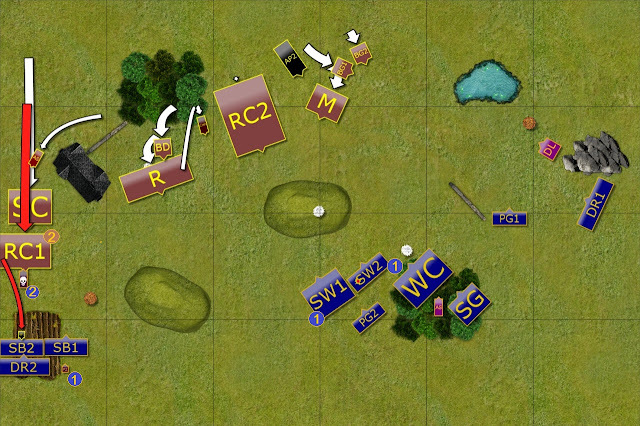 While some of the Elven units consolidated positions around the objectives on the flanks, the regiments in the center kept fighting. 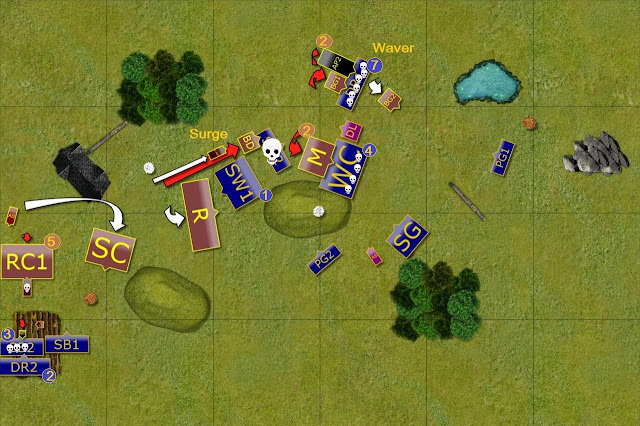 Well coordinated attack by Palace and Sea Guard units destroyed the Bone Dragon. Storm Wind attacked Mummies but did not inflict enough damage to rout them. Seeing that the Elves still have too many units and managed to control the crucial objectives, the Pharaoh ordered his remaining minions to withdraw. Many thanks to Ed for yet another great game! I really like his army as it is quite unique in comparison to what I have faced so far. I must also admit that while I managed to win this time there were many moments in the game that things could have gone completely different. In general, I was happy with my plan and the fact I did not got caught out of position by Surge too often. The delaying force on the left flank did very well, as the exchange of units went into my favor and in the end Ed run out of scoring units in that area. However, I must say that volley by Silver Breeze cavalry was a total surprise. I wonder what would have happened if I didn't destroy that unit. It would be interesting to see if these two fast cavalry units would still be able to prevent the enemy from securing the objective. Turn 3 charges also worked well enough as I stopped the advance towards the center objectives and managed to limit the power of Surge a bit. I am glad some I kept my eyes open for the opportunities to attack the Surge casters so that I could stop them from using that dangerous spell. I got lucky with the Pharoh on the chariot but if I had the same option again I would still charge. Ed got unlucky in a few combats and when he tried to push his Giant into the flank of my Sea Guard. The fact that War Chariots held his units for so long was unexpected and definitely contributed to the end result. We didn't go to turn 7 so it would be interesting to see the outcome. In general, I am glad things worked this time but as you could see there were too many factors that could contribute to a completely different result. At the moment I don't have a new plan yet but I need to come up with a more solid one. Great game! There is a list in the US currently that has many similarities to the one Ed ran. The list won best overall at the US Masters and had a bone giant, chariot, bone dragon heavy approach. It seems like it’d be very versatile and be a lot of fun to use! I’m sure you enjoyed the regiment of sliver wind cav as well as the flying hero that allowed you time to reposition. Having a unit that can do as much damage on a charge as your cav regiment should bring lots of benefits. The long range of their charge and ability to rout many smaller units in one go allows you to possibly charge deep into opponent territory, remove a smaller unit, and reform to project threat from behind enemy lines. Adding nimble to the unit increases this threat but is more expensive and loses you a unit strength so definitely pros and cons. Were the drakons on the left flank out of range on the revenant horde’s rear? They probably were but I’m assuming it was pretty close since the character with wings made it into that combat. I’m looking forward to your continued play with this list. Should make for fun reading! Thanks a lot for your comment and apologies for late reply. It was definitely good to have a unit that can punch harder but I will see how it goes in other games. My current concern is that it will stand out among the units and will attract more attention than it is required. Perhaps I will be able to use it to my advantage. However, one of the principles of MSU was to have units of more or less equal value/threat potential, so that the enemy cannot focus on a single target. At the same time I was not good enough at creating opportunities for flank charges. Having a unit that can potentially break through on the charge is something I decided to try fro that reason. That's a good question about the Drakons. I didn't check, I didn't think about that option unfortunately. I tried to estimate the distance based on screenshots and it seems like they may have been too far away. However, I should have checked that! Thanks again for the comments! Hopefully, I will have the chance to play some KoW soon!